Michael McFadyen's Scuba Diving - Tanna, Vanuatu The Vanuatu island of Tanna was first discovered in about 400BC when people arrived from the north. The first known European visit was in August 1774 when Captain James Cook in his boat the Resolution explored the New Hebrides (as he had named it). When in the vicinity of Tanna, Cook sighted a red glow in the night sky. He decided to investigate and in so doing discovered yet another island. Cook landed in Port Resolution (now home to a over friendly and amorous dugong). Mishearing the locals name for earth, muk-tana, Cook named the island Tanna. The glow that Cook had seen was, of course, the Yasur Volcano. Located in the south-eastern corner of the island, Yasur does not rise too far above the jungle and ash laden countryside. What it lacks in height, however, it certainly makes up for in other ways. Tanna is 55 minutes flight south from Port Vila in a De Haviland Twin Otter. The landing at Burton Airfield is quite an experience. The runway goes downhill for about 300 metres before running relatively level for 200 metres. It then climbs back up another hill for 500 metres or so before again dropping away. Despite this, the Twin Otter lands and takes off in only a few hundred metres so is well down (or off) before reaching the flat sections. On my visit to Tanna I stayed at the Tanna Beach Resort. Tanna does not have a real town as such, just a small collection of shops and one bank. The Resort is located about five kilometres to the south of the airfield and three kilometres to the south of Lenakel, the island's only "town". Between the Resort and Lenakel but off the main road is the administrative centre of Isangel. This is merely a collection of Government buildings including the open air court, Police station, Public Works Department and the Provincial Government Offices. The Tanna Beach Resort is located in a small valley right beside the sea. The cabins are very Pacific Islands and quite comfortable, although some people may consider them basic in nature. Hot and cold water and toilets are in each cabin and their verandahs overlook the Pacific Ocean. The food at the Resort (there is no other place to eat) was quite good and reasonably priced (in relation to Vanuatu). The main reason we went to Tanna was to visit the Yasur Volcano. It is about 60 minutes or so in a four wheel drive from the Tanna Beach Resort to the volcano. You cross right through the centre of the island and get an excellent feel for the island's geography and population. Past very small villages we go, past traditional nakamuls (kava joints) to the other side of the island. As we descend down to the lowlands we get an excellent view of the whole south east section of Tanna right to the volcano. As we get closer, the sulphuric smell of the volcano comes to us. The dirt road turns into a ash covered, black track that looks very soft. The vegetation alongside the road is covered in fine ash. Finally we arrive at Yasur. We drive up onto the downwind side of the volcano. The side of the volcano is totally dead, with the ash tens of metres deep even four or five kilometres from the crater. The trees are strangled by ash, only a metre or two sticking out of the ground. We park and wait for the other cars to arrive. We walk around the tops of the trees. The ash is so fine. I have even been told that a couple of people have used snow skiis and snowboards on the side of the volcano. It would be an excellent experience. Soon the others get here so we speed across the flat land below the volcano. Past a couple of small lakes, surrounded by ash and dead trees. We come around the back of the volcano and enter the jungle, upwind of the volcano. The track winds up the side of the mountain and eventually arrives at the "parking area". We grab our torches and cameras and head up the rough track to the viewing area. The sun is almost setting and the sight is spectacular. The roar from inside the crater cannot be believed. It is as if a Boeing 747 is taking off only metres from us. Steam pours out of the many vents dozens of metres below us. All of a sudden, there is a huge explosion and the already deafening roar sounds like the space shuttle lifting off. Huge rocks and boulders fly up into the air, a hundred metres above our heads. We watch to make sure they do not land on our heads. We decide that, although this is very exciting, we want to get closer to the action. So we head up the volcano a bit higher and look down into an even more violent section of the crater. Fire, smoke, ash and bits of lava leap out of three or four vents. Some rocks the size of cars fly up into the sky. This is the most exciting thing I have ever experienced above water (and I mean the most exciting). A couple of people decide that it is too exciting for them so they go down the mountain a bit. It is now completely dark (it only takes a few minutes for the sun to set) and it is even more spectacular. The glow of the red fire and lava certainly makes a sight. Eventually we head back down to the cars and the hour long trip back to the Resort. As we have a relaxed dinner with a few drinks, the talk obviously returns to our recent experience. We have been scared out of our wits by the might of nature, but every person agrees that it is a sight that they will never forget. The next morning we have a swim at the Resort. Some of our group go on a trip to a cargo-cult village (very hard to explain here, but basically revolves around people who believe that they will eventually inherit great riches - comes from well equipped US troops in WW2). A couple go snorkelling off the Resort and the rest of us walk the couple of kilometres into town. Really, town would be the wrong word, it is really just a collection of a few shops. We see a crowd of locals sitting under a huge tree beside the sea, watching the children swimming in the ocean. What a life! One of our group videos them and they ask to see the footage. He shows them and they are entranced. He then shows the footage shot of the Yasur Volcano last night. The people engulf him, all wanting to see the sights. Most have never been to the volcano even though it is (relatively) close. They are laughing and oohing and aahing as they watch the fire and brimstone. Finally, his batteries give out and the locals let him go. We walk up to the largest shop and buy a cool drink (it is extremely hot and humid). Opposite, the concrete wharf built by Japan lies in ruins, wrecked by a cyclone a few years ago. We pass the primary school and the children rush out so see us. I video them waving at us. I replay the footage back them and they love it. It is possible that they have never seen themselves before on TV (I thought they probably would have considering a lot of Australians go there). The kids laugh and giggle, they point at each other as they recognise their friends. This is very special. We return to the Resort for a welcome swim off the black sand beach (where the Resort's sheets are lying on the sand drying!) and lunch. By now, we have decided that we should have stayed on Tanna Island for at least another night, this is how much we have enjoyed ourselves. I can certainly recommend Tanna Island and the Yasur Volcano. If you get a chance, go to Tanna for at least one night, preferably two or three. It is a very relaxing, friendly place. For more information on Tanna and other islands in Vanuatu, see Stan Combs' Web Site dedicated to Vanuatu. 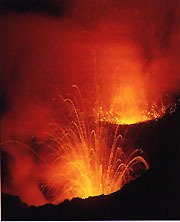 For more information on the Yasur Volcano, see the following site which is in a specialised volance web site.